Workers can beat big business when they come together, but the fight would certainly be easier if the state were generally on their side. Domestic workers in Mumbai, India at a signature campaign for the ratification of ILO convention 189 on decent work for domestic workers. IDWF/Flickr. (CC 2.0 by-nc-nd). Penelope Kyritsis (BTS): What do you think the state's responsibility is with regard to protecting workers' rights to association and peaceful assembly? Elizabeth Tang: Workers' rights, and the freedom of association and assembly, are basic human rights. So the state has full responsibility to ensure that each of their citizens enjoy these rights. This also ensures a level playing field. This is not about giving favour to individual groups, but to ensure that workers and employers are able to sit down and speak at the same level about rights and also issues concerning the labour-employer relationship. Freedom of association is the only thing workers have on their side when bargaining with the might of business. Sanjiv Pandita: We also believe that because historically capital and the industrialists have been more powerful than the workers, government has to provide some extra support for workers so that they can bargain. Freedom of association is the only thing they have on their side when bargaining with the might of business. So government has to take actual steps. You'll see that historically this happened in Europe and also in America – the state provided extra support to labour because of its comparative weakness to capital. Now, states are shrinking back from those responsibilities. We want states to return to their role of providing extra support to labour. Penelope: What are the biggest obstacles to that? Elizabeth: The biggest obstacle is the expanding corporate power, which is working only for profit, or for its own greed. They use their influence to stop governments and states from performing what they should be performing – to ensure a level playing ground for everybody in society. Sanjiv: Following on that: corporate power has increased too much. The disparity between capital and labour is at a historical high. The profits that companies are making right now are at their highest ever. That means that labour's bargaining power has been reduced drastically. The space for organising has been reduced, the democratic space has been reduced because of both corporations – as Elizabeth pointed out – and repressive states. States are colluding with the companies, and the companies are bigger than states. You know, the personal wealth of many people is bigger than the GDPs of many countries. This has never happened in the past. The personal wealth of many people is bigger than the GDPs of many countries. This has never happened in the past. Penelope: So given these obstacles, what are some of the success stories in your work that highlight how positive change is possible? Elizabeth: I think the biggest success story is the adoption of the ILO convention concerning decent work for domestic workers. 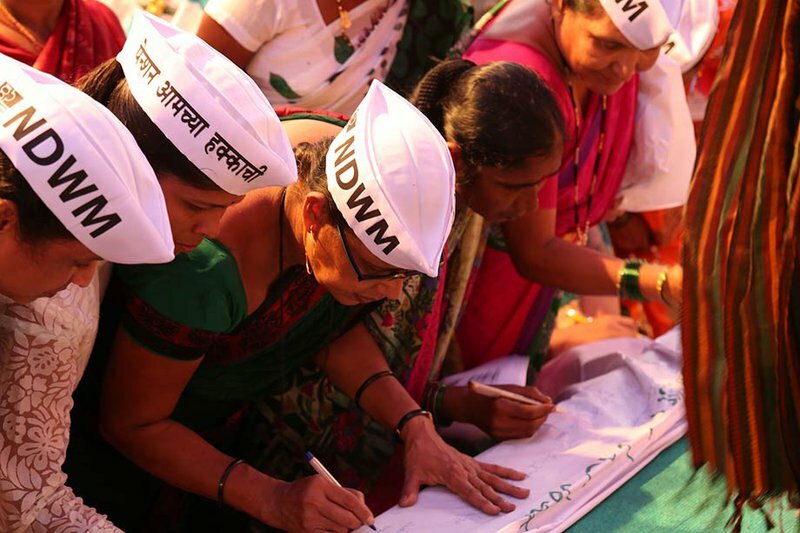 There was a huge mobilisation of domestic workers along with trade unions, workers of different sectors, civil society organisations, human rights organisations, migrant organisations and feminist organisations – there were so many different players and social movements drawn together to make this convention possible. So this is really one of the greatest successes of alliances in the recent past. 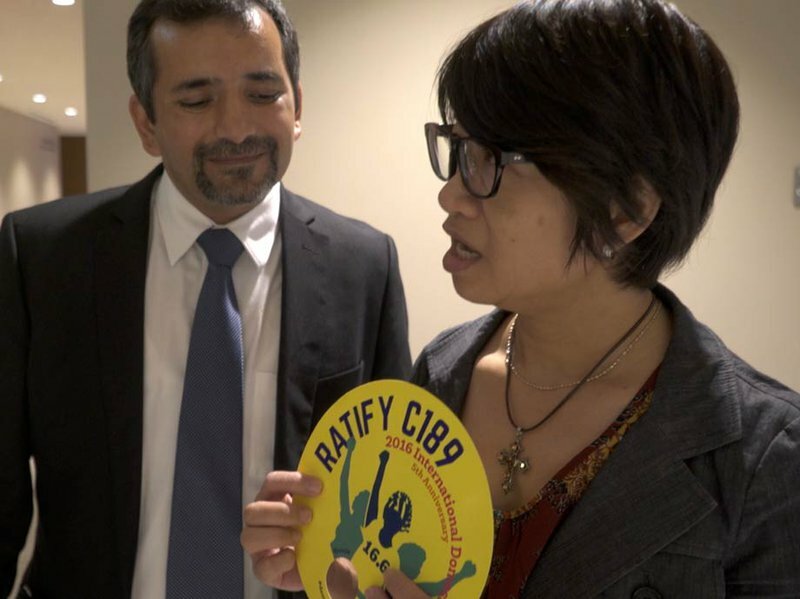 Elizabeth Tang exhibits a placard supporting the passage of the ILO domestic workers convention while on break at the UN. Photo by Penelope Kyritsis. Creative Commons. There are so many success stories – all you have to do is pick up a newspaper and see how many strikes are happening in China right now. Despite the aggression people are opposing it right now. It's getting more and more every day. So the more you repress, the more people are coming together. Talking in terms of Asian politics, democratic spaces have been reduced but that has not stopped people from organising. They're organising and moreover there are new forms of organising taking place. They're curbing the traditional labour movement, but membership organisations are taking a new form and collective bargaining has gone to a new level. It's not happening at factories anymore – it's happening more at a political level. There's more political bargaining happening now, as in the case of domestic workers.